Greece is a country of strong traditions. Despite (or maybe thanks to) its turbulent history marked by numerous foreign occupations, the sense of ‘Greekness’ is deeply embedded in the minds and habits of the Greek people, and customs and traditions are strongly alive in the daily lives of people. You might find this hard to believe when you observe young Athenians whose idea of a good night out is a pizza dinner followed by dancing and drinking cocktails in trendy seaside nightclubs that have little to do with traditional Greece, but that’s only the surface. They too will dance to the captivating rhythms of the typical Greek music, know the lyrics of traditional songs (and sing along!) and observe all national customs and traditions just like their parents, grandparents and the generations before them did. The average tourist holidaying in Greece will experience little, if anything at all, of the traditional Greek ways of life. 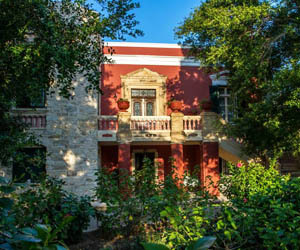 Staying in tourist resorts, the closest they will get to Greek culture or customs might be a taxi driver playing with his worry beads or a glimpse of old men in a kafenion drinking tsipouri and playing tavli. For many, that is enough; after all, all they come for is a bit of sunshine and relaxation. Fortunately, there are also plenty of visitors with a more profound interest in the country and its people. All they need to do is stay away from the beaten tourist track, because everywhere else, Greek tradition (music, celebrations, orthodox religion, festivals, hospitality…) is very much alive. Many of the Greek customs and traditions have their roots in the Greek Christian Orthodox religion. The church plays an important role in the daily lives of the Greeks, and religion and tradition are intrinsically interwoven. According to tradition, children are named after their grandparents, but until a baby is baptized, his or her name is not used. Children get their birthday parties, but the religious name days are considered much more important and celebrated intensely. Civil weddings do take place, but they are rare: the large majority of Greek weddings take place in church (even if the bride and groom are not practicing religion). Easter is the most important religious holiday in Greece, and is preceded by 40 days of fasting during which, with a few exceptions, no animal products are eaten. People don’t stick to the 40-days rule so much any more (young people who do so are often motivated by health reasons! 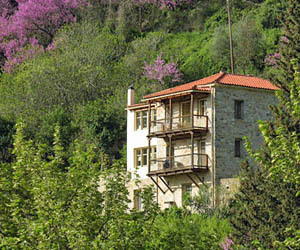 ), but on ‘Clean Monday’, marking the end of the carnival period (apokrias) and the beginning of the 40-day fasting period, everybody goes out to fly kites and eat a traditional Lent meal of pickled vegetables, dips and a few types of seafood allowed during the fasting period (octopus, squid, mussels, shrimps). The Easter celebrations last a week (‘big week’). In the evening of Good Friday throughout the country beautiful and touching Epitaph processions are held. The following evening, the Resurrection celebrations start. People carrying unlit candles gather around the church starting from Saturday evening in anticipation of the Easter service, which begins late at night. At midnight the priest announces that Christ has risen and appears with a candle lit by the Holy Light which he passes on. Candles are lit one from the other, wishes are said, and then the people make go home for the traditional feast of red Easter eggs and magaritsa soup made of lamb innards (I skip that one!). Easter Sunday is a holiday for visiting friends and relatives and eating and drinking together. Lambs are roasted on the fire (a ritual that involves long hours of manually turning the spit), houses are open to every guest and the atmosphere is friendly. 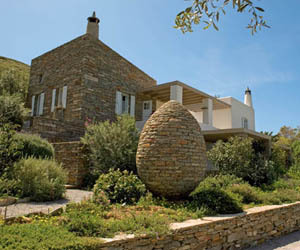 The Easter week is a great opportunity to experience some of the most deeply rooted Greek traditions, but beware, it is also a period that Greeks are ‘on the move’ and travel arrangements should not be left till the last moment. Christmas is also celebrated in Greece, but it is not as important as Easter. It is a period of family dinners and parties that continue until New Year’s Eve. There is no tradition of opening presents at Christmas, but gifts are exchanged on New Year’s Day. Then on the 6th of January, Epiphany is celebrated with the blessing of the waters. Throughout Greece crosses are thrown into the sea, lakes or rivers. Brave swimmers then dive into the water to retrieve the crosses. August 15th, the day of Virgin Mary, is another major religious holiday in Greece. Festivities take place at churches throughout the country with religious services, eating, drinking and dancing. The 25th of March is one of the major Greek national holidays, commemorating the Greek victory over Turkey ending the War of Independence. Major parades are held throughout the country, with the participation of both the military and schoolchildren. The 28th of October is the Greek “Ochi Day”, celebrating the Greek “No” to the Italians at the beginning of the Second World War. Military parades are held everywhere in Greece. 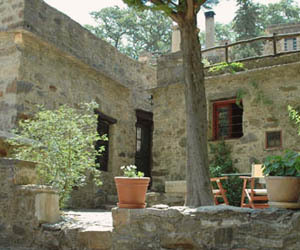 During the summer, in various places in Greece cultural festivals are held. The best takes place in Athens in the Herod Atticus Theatre with performances (from June till mid-September) by renowned artists from all over the world. Very impressive also is the Epidavros Festival in the ancient theatre (at about 30 minutes’ drive from Nafplio). 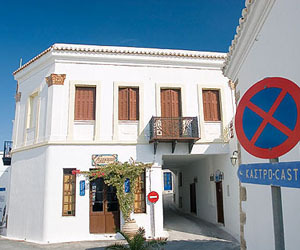 Smaller cultural events take place (amongst others) in Patras, Iraklion, Santorini, Corfu, Chios, Zakynthos and Paros. You don’t speak or understand the language, you don’t have Greek friends to take you around, yet you do want to experience some of these Greece customs and traditions. What to do? The answer is simple: go against the tourist flow. Visit an island in the winter and you will meet the islanders, who are not much used to seeing new faces in the winter. 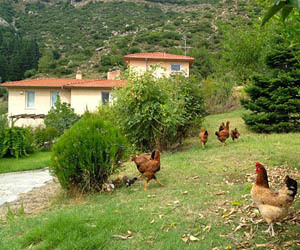 They will welcome you into their little communities and share with you the soothing rhythm of their daily lives. 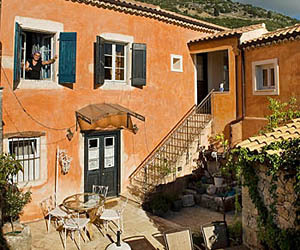 Or in the summer, when everybody else goes to the sea, travel to the mountains and the little villages on the mainland, and there too you will discover the ‘real’ and profound Greece. 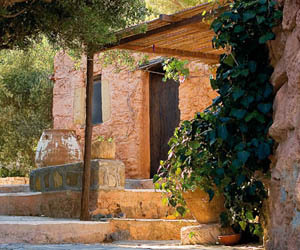 Spend Greek Easter in a little village anywhere in the country. At any time of the year, try and catch a panayiri – a traditional feast to celebrate the name day of saint a particular church is devoted to. 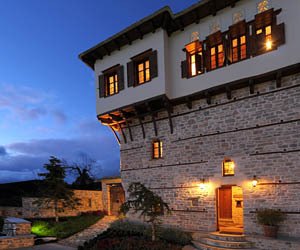 A beautifully restored mansion on the mountain slopes of Pelion, offering a fine blend of luxury and tradition, with gorgeous bedrooms, charming sitting rooms, a swimming pool and a great breakfast. 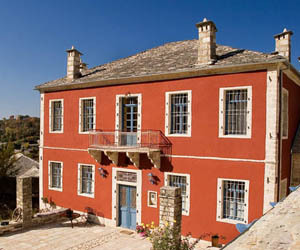 A bed and breakfast full of character a short stroll from the beach on Leros Island. Fresh, romantic and sweetly old-fashioned looking rooms, and a delicious, healthy breakfast served in the peaceful garden. 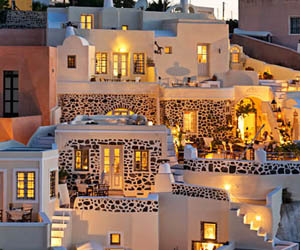 This is Greece off the beaten track. 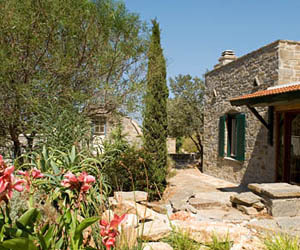 Two charming self-catering apartments in a restored historical village house; a fantastic setting for relaxing holidays near nature and sea. 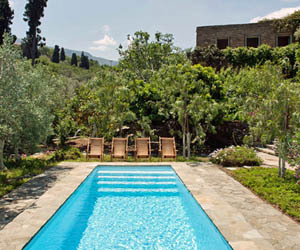 An old olive farm in the hills of western Crete turned into the perfect little hotel for spoiling holidays. 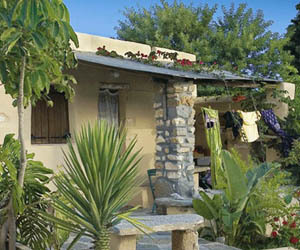 Charming accommodation, traditional Greek meals, a great swimming pool and a small spa centre. 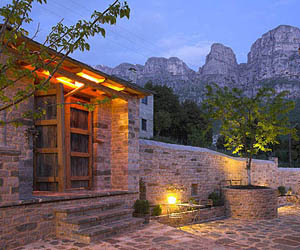 One of my favourite mountain guesthouses in the Zagorohoria. 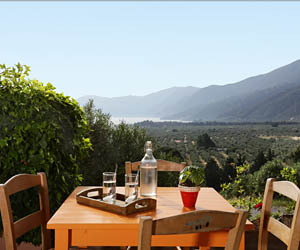 Wonderful, comfortable rooms, adorable owners, staggering mountain views and the best Greek restaurant of Papigo! 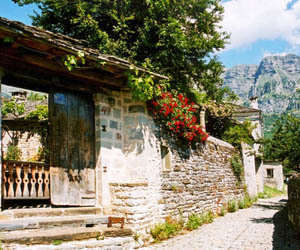 In Papigo, one of the prettiest villages in the mountains of Epirus, a comfortable and cosy guesthouse with the kindest host who organises mountain treks, rafting and other outdoor activities. 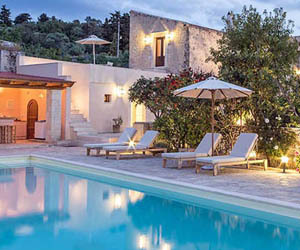 A peaceful holiday retreat hidden in the hills of Paros island, with three charming self-catering cottages set in Mediterranean gardens. Participate in creative activities or simply go to the beach and relax. 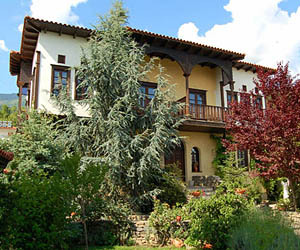 A truly inviting family-run inn/bed and breakfast in Ano Poroia, overlooking Lake Kerkini in northern Greece. 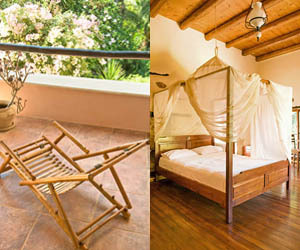 Warm hospitality, charming rooms, great breakfasts and lots of scope for outdoor activity. 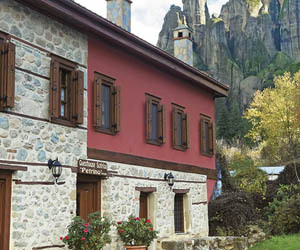 An adorable traditional guesthouse in a quiet spot right by the dramatic Meteora rock formations at Kalambaka. 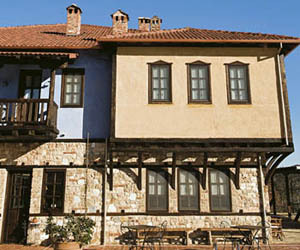 This is a truly inviting place to stay if you want to visit the historic Meteora Monasteries. 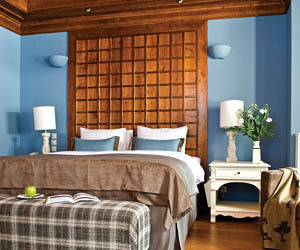 A glorious luxury mansion hotel with beautiful rooms and suites, great sitting rooms and an outdoor pool. 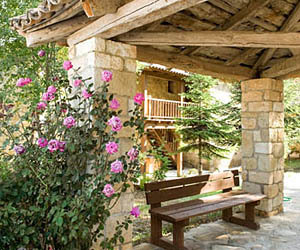 The setting is Alpine, the village is laid-back and quiet, and the feeling is totally spoiling.